If your only memories of beets (like mine) are those red, canned, jelly like vegetables, then read on for more appetizing and yummy beet recipes. When selecting beets, you should always look for ones with the green leaves still attached. Not only are the greens edible, but it also means the beets will be freshest. Besides examining the leaves, you should look for small to medium roots without any soft spots or splits in the skin. The color should be a deep red or clean white or yellow (with no large blemishes). The smaller beets usually just mean they are younger and thus more tender, so don’t worry about the size, bigger isn’t always better with beets. When you get your beets home, simply cut off the greens, leaving about two inches attached to the root. If you are planning on eating the greens, which work great in salads or sautéed with a little olive oil, then store them in a plastic bag in the refrigerator for up to a few days. The root part can be store unwashed in your refrigerator for up to about four weeks. When ready to use them, just wash them, no peeling necessary. 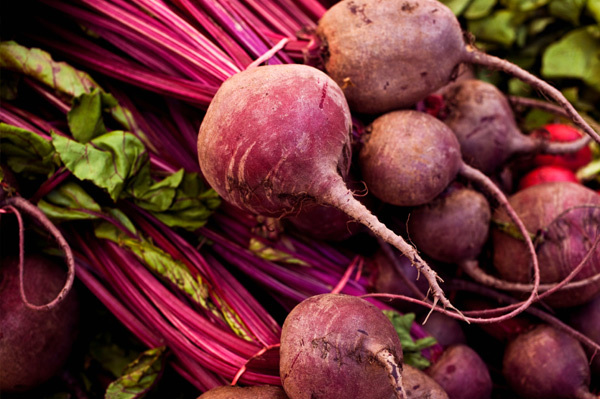 One of the most basic ways to prepare beets for eating is to boil them for about 30 to 50 minutes, or until they are fork tender. You don’t want to cook them too much or most of their healthy benefits will be reduced. Once they are tender, the skins should slip off fairly easily or, if the beets are very young, the skins can be kept on and eaten. They also work great when roasted or sautéed. Beets are delicious when served chilled in salads, roasted, or sautéed with a little olive oil or lemon juice or served with other root vegetables. Some flavors and ingredients that pair well with beets are orange, fennel, goat and feta cheese, and hearty greens. You can even serve raw beets grated over the top of a fresh salad.